May Day (Beltane, Walpurga’s Day, et al.) is a good time for reflecting on politics, ecology, and possibility. The following can be considered part of a series on this blog. When neoliberalism is understood as the alliance between economic liberalization and social liberalization — that is, between those who would “liberate” capitalist markets (who sometimes get called fiscal conservatives, but who are always economic globalists) and those who would liberate us, individually, from the rigidity of communal social norms — then it becomes understandable why the primary popular alternative on offer today is the kind of “populism” that would defend “traditional” social values while claiming (even if mostly just pretending) to also want to reign in market forces. Thus the popularity of Trump, Farage, Le Pen, and their ilk. The left’s decline is due in no small part to the fact that so much of it has found a comfortable relationship with neoliberal, i.e., economic, globalization. It is perceived, by those who aren’t part of it, as part of the problem. And where the left rejects economic globalization, its representatives — anarchist youth, labor activists, environmentalists, et al. — are perceived as out of touch with the values and desires of the mainstream. So we see traditional left-wing parties — from Greece’s Pasok to UK’s Labour and France’s Socialists — pretty much shattered, while populist insurgents outflank them on the right and the left. The anti-globalist left — from Greece’s Syriza and Spain’s Podemos to Bernie Sanders, Jean-Luc Mélenchon, and Jeremy Corbyn — face the prospect of either running within their traditional party frameworks but losing hold of their own electorates (e.g., Corbyn) or running as outsiders and, once in power, facing intense pressure to cave in to the neoliberal hegemony (Syriza). Mostly, however, if they are seen as too socially liberal, that’s used, usually effectively, against them. Is there a problem with the way in which emancipatory aspirations, the kinds still embodied for some by May Day, have gotten framed? It’s helpful to remember that liberatory universalism remains a powerful attractant around the world, particularly on young people: note its recent role in revolutionary movements in Egypt and across the countries of the Arab Spring, in Ukraine, Iran, and elsewhere. Where its goals are allied with mainstream desires and not reconfigured as the “divisive” concerns of social elites (such as those of coastal liberals in the U.S.), it has worked well in shaping aspirations for change. On the other hand, even where it’s succeeded in bringing about change, it has regularly been outflanked by secular militarists (Egypt), ethnic nationalists (Trump, Ukraine), religious conservatives (all too often since the 1979 Iranian revolution that set the template), populist demagogues (Trump, Putin, Erdogan), or some combination of the above. The future may lie in the hands of the young, but the present rarely does. One thing that might help is to refocus the discussion away from “labor” itself — which has become a minority discourse, at best — and from the specifics of the left’s other issues, however valid they may be (gay and transgender rights, equal pay, the fight against coal and fracking, et al.) — toward livelihood. We all need to make a living. Some of us — deindustrialized regions, indigenous communities — have lost that capacity as our communities have been decimated. Others have found it too easy to make a killing from rigging the economy to their own ends. The struggle for fair and sustainable livelihood is both universal and economically realistic. It connects the desire for a viable economy with the need to rebuild communities — which, after all, have been the main victims of neoliberalism. That those communities should be inclusive rather than ethnically, racially, or religiously exclusive, is something the liberal left will continue to have to insist on. But that shouldn’t be so hard once the centrality of livelihood is reasserted. Greens, meanwhile, have gotten too identified (at least in how they are perceived by others) with the process of lobbying political elites toward their causes. But the struggle for right livelihood — for developing sustainable jobs within just economies — is something that is very much alive among environmentalists working at local, regional, national, and global levels. It should continue to shape our efforts toward an ecologically sane future. Livelihood, and liveliness, is very much what May Day, with its bonfires, festivities, and labor rallies, ought to be about. 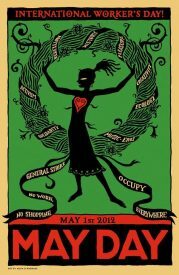 Happy spring (to those of us in the northern hemisphere), happy Beltane, happy May Day. yes thanks livelihood is better than labor and keeping workers in mind is vital to any effort that seeks to win majorities. I have fix the connection in the windows to join the bluetooth device https://fixconnectionsbluetoothaudiodeviceswirelessdisplayswindows10.net it is the best version that i have seen because there is lots of new function will be learned while we know about the bluetooth connection you have enjoyed well after connecting this the wireless device in the windows.